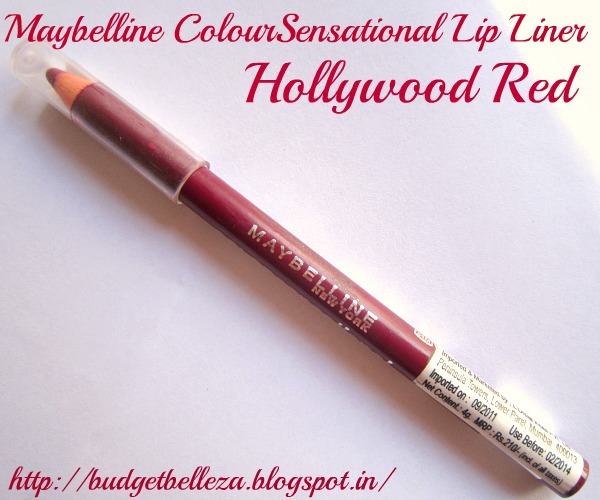 Now coming to the review...the product I'm all set to talk about today is Maybelline Color Sensational Lip Liner-Hollywood Red. By now you guys must be aware about my love for lipsticks and this incorporates Red lipsticks too. But I have come across some red lipsticks that have acquired a degree in bleeding out of my lips.The reason behind buying this lipliner lies in this bleeding fact only! Click here to read my post on My Perfect Red Lipstick. Company Claims: Keeps your lip color looking beautiful with coordinated lip liners that won’t smudge, smear or bleed. Slant tip and slim-line barrel provide precise application and control for a perfectly defined look. Creamy formula with Vitamin E glides on silky smooth. Prevents feathering and bleeding. Directions To Use: Line your lips starting in center of your upper lip. Work from the center to outer edges of your lips, following the contour of your mouth. Follow the same technique for your bottom lip. 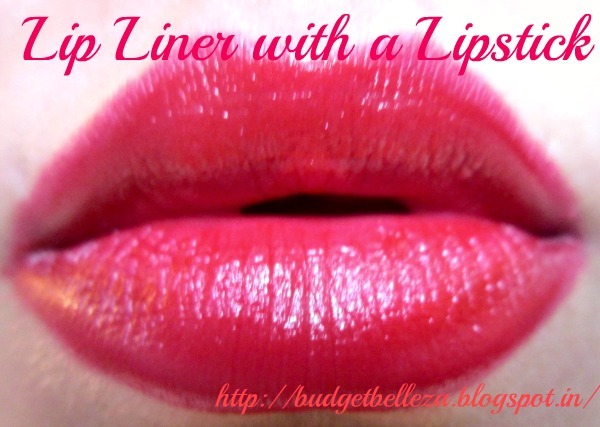 To extend the wear of your favorite lipstick or lip gloss, first fill in your lips completely with lip liner. The shade Hollywood Red is a deep deep red almost maroon.It has pink undertones.It is the kind of maroon which our mom's used to wear ;) Being a lip liner its fine,but I would have never worn this shade as a lipstick :/ Its quite pigmented and a second swipe is required only to even out the finish and not to bring out the colour. Texture: The texture of Maybelline Color Sensational Lip Liner-Hollywood Red is smooth. I didn't have to pull it on my lips.It outlined my lips in a creamy gentle manner (thanks to the rising temperatures,nothing feels dry anymore). On a more serious note *tries to sound practical and sober* Maybelline Color Sensational Lip Liner-Hollywood Red is a pencil lip liner which requires to be sharped frequently if you like a sharp point and thin lines,I personally like it blending into the lipstick so not a big fan of thin line..thus works for me! The texture is smooth,so no pulling the pencil on the lips is required. Not super creamy,yet this one is smooth enough not to hurt you in case you suffer from dry and chapped lip outlines. Coming to the shade,well this one would go only with your dark red to maroon lippies. Personally,I didn't like Maybelline for naming it Hollywood Red because the name gives me an imagination of a la Gwen Steffany or Dita Von Teeseor even Cameron Diaz for that matter. But this one's close to maroon :( I somehow managed to blend it with my red lippy here! 6. Prevents feathering and bleeding of lipstick well. 1. Its not red,its maroon. 2. Needs to be sharpened often,so product wastage. 3. Need to carry a sharpener along with this while travelling. Last Word: I have no qualms about the formula of Maybelline Color Sensational Lip Liner-Hollywood Red. Its only the shade that put me a bit off. But it does the job of a lip liner really well. 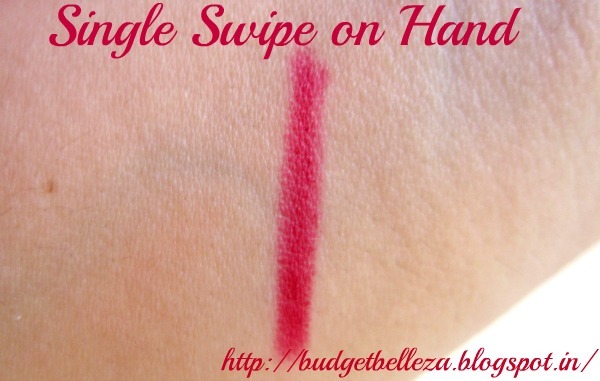 Repurchase: Not this shade for sure,infact I would ask you ladies to suggest me a good (read affordable as well) red lip liner which is actually red in colour in the comment box. But I will give some other shade from this range a try.